Before we begin this week, I want to take a moment and thank all of you for support during this year’s #GivingTuesday. With all of our matching-funds donors we raised just under $6000 to help Renewed Heart Ministries grow and I can’t thank you enough. Our work resonates with so many of you and I’m so thankful for your support. We are looking forward to doing even more in this coming new year. 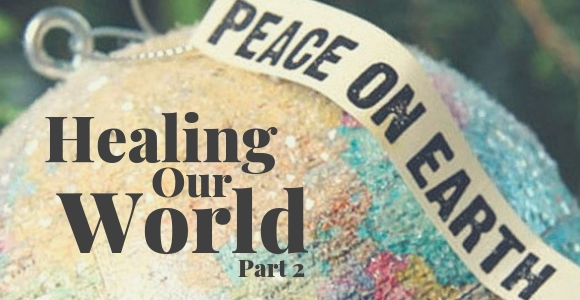 This last October, we ran an article entitle Healing the World. Shortly afterward my friend Joel Avery sent me a story about deep racist medical neglect and abuse in a healthcare facility then owned by the Christian denomination I grew up in. If we are to be agents of healing and change, we must admit where we have been the source of injustice rather than healing. “I think sometimes we believe that the very nature of the healthcare industry, and the particular view of healthcare that we have here at Advent Health University insulates us from the ills of society. Lucy Byard is a name not often remembered inside or outside of the Seventh-day Adventist Church – understandably so. She arrived at Washington Sanitarium and Hospital (an Adventist Hospital) on October 14, 1943, in critical condition. Because of her condition, the hospital admitted her immediately. There was just one problem – she was Black and Washington Sanitarium did not admit Black people. Once they discovered her ethnicity, they removed her from the room they had given her and made her wait in the hallway in a robe. Hospital managers made arrangements to transfer Byard from the Maryland-based hospital to Freedman’s Hospital, the Black hospital in Washington, DC. No one at Washington Sanitarium examined or treated her before they transferred her. They eventually transported Byard to Washington, DC not in an ambulance but in a car. Unfortunately, she died at Freedman’s Hospital before doctors could treat her there. Lucy Byard died after being rejected from an Adventist hospital. On that day in 1943, healthcare workers decided to exemplify the worst that society has to offer. Byard’s death incensed African-American Adventists in the Washington, DC area. As a result, African-Americans created an advocacy group and sought equality of treatment in the Adventist Church. I wish the Lucy Byard incident had a more Hollywood ending. I wish some white knight at Washington Sanitarium rode in on his trusty steed to stand up to racism and save the day. I know this story makes us uncomfortable. However, it is important for the Lucy Byards of the world to be remembered and for their stories to be told, despite how much it hurts us to tell them, and to remember that we live in a world where these things can happen. Black History Month is not only about celebrating the accomplishments and societal contributions of a particular group of people. It is also about the recognition that part of what makes those achievements so extraordinary is the pain and anguish overcome in order to make those accomplishments a reality. Race is not the only issue where many faith traditions are on the wrong side of history. The same denomination whose hospital turned Byard away is today faltering on the path to gender equality with a century-too-late debate on whether or not women can be ordained as pastors. They also, with most faith traditions today, are still the source of much of the exclusion, pain and damage experienced by many of my LGBTQ family, friends and neighbors. I’m often embarrassed to be associated with Christianity. The salt really has lost its saltiness. We can be added over and over to whatever issue, and rather than changing the flavor toward justice, we instead take on the flavor of the social ills around us. When it comes to justice, inclusion, or equity, often the outcry is that the church is being negatively influenced by culture. Truth be told, it always has been. We are people living within time, space, and cultures. And we must ask: are we adding the flavor of justice, inclusion, and equity to our society or are we are taking on the bigotry, fear and exclusion we see in our culture around us? Exclusion, whether racism, misogyny, homophobia, or whatever, is already within many us. What are our faith traditions doing to challenge and change us so that we can participate in making our larger society more compassionate, inclusive, just and safe for everyone? Are they helping us be more just, or are they embedding injustice more deeply into our souls? A few weeks ago I shared with friends a Washington Post article on the historic level of diversity we are now seeing in among incoming Congressional freshmen in Washington, D.C.. While several of my Christian friends know how much representation matters and saw the news as a sign of hope, a few of my other Christian friends saw it as bad news, as slander against White people. I had to shake my head. The kind of Christianity that’s focused on postmortem bliss is too easily co-opted by those at the top of social structures. It becomes complicit in oppression, whether it be in matters of economics, race, gender or sexual equity, or other issues. Mainstream Christianity has played a role, sometimes the central role, in damaging marginalized groups, and the idea of getting to heaven has been used to keep marginalized people pacified. In the gospels, we don’t read of Jesus going from place to place trying to get people to say a special prayer so that they could go to heaven when they die. He brought liberation into people’s lives in the here-and-now, today. This is not easy to hear if, like me, you identify with the Christian tradition, but I imagine that non-Christians might positively resonate with much of it. As followers of Jesus we’re called to bring economic healing, racial healing, gender-inequity healing, political healing, religious healing. We are called to bring healing. Full stop. But how? Where do we start when we have such a history of quite the opposite? First, we must be willing to name or admit societal ills, and we must own where we have played a part in those ills in the past. We must learn from those affected most by our past actions, including those whose have lived experiences as survivors. Then, where we are able, we must work for reparation, transformation, and healing alongside those who have been hurt. 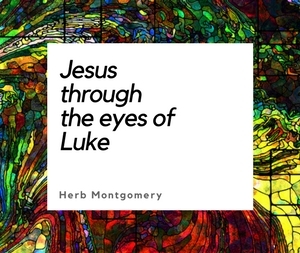 The story and teachings of Jesus can inform each step of this process, too. But we must first learn to listen to those we’ve hurt. Another world is possible. It’s not easy. It is work. But it’s possible, and worth it. 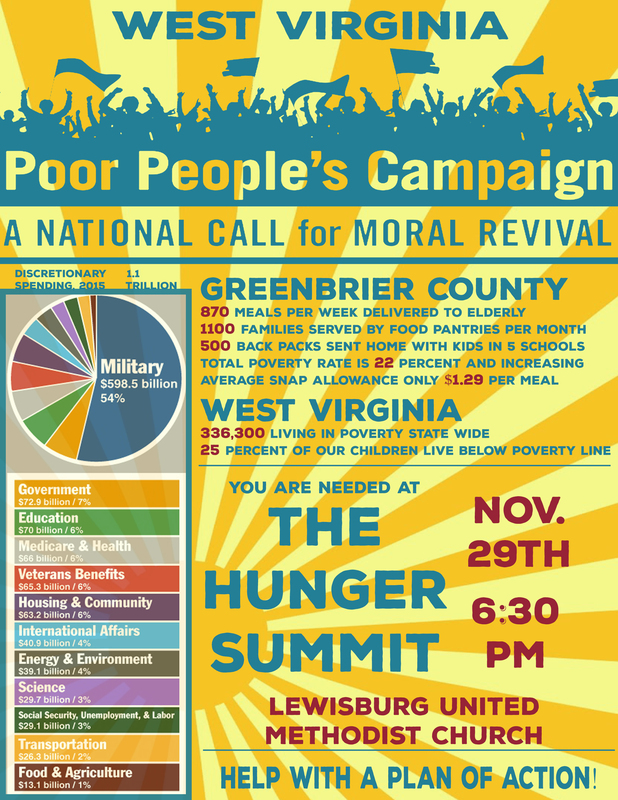 Last night I attended the Hunger Summit event here in Lewisburg sponsored by the Greenbrier County branch of the National Poor People’s Campaign, a Call for Moral Revival. 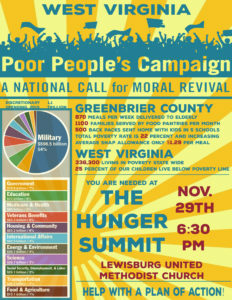 This event was designed to increase public understanding of the challenges encountered by those who live in poverty here in Appalachia. Those who spoke relayed firsthand experiences with poverty and then we all were invited to participate in creating and implementing possible solutions. This week, as we begin the holiday season, as a Heartgroup, choose some avenue in your community to become involved in and engage in the work of healing our world. This is a time of year when want is not only felt, but hearts become more open to caring for one another. I want to encourage you to get involved in your community as a group and make a difference. Write in and share your experience with us here at RHM. I can’t wait to hear from you!